3rd and 1st Platoons of Bravo Company, 1/26 walked into two ambushes that decimated 3rd Platoon and a little later, part of 1st Platoon while it moved to reinforce 3rd Platoon. The event remains one of the most horrifying of my memories of that long and terrible siege. Prior to this date, back in 1968, Bravo Company ran patrols out on the south and east sides of Khe Sanh without much action, and it was a surprise when 3rd Platoon marched into the initial ambush that morning. The patrol is well documented in books and films, and the action’s memories haunt the Marines and Navy Corpsmen who managed to work their way back to the combat base. For some of the men, it took hours to get back. Some don’t really recall coming back. It is a horror story. The few Marines I recall seeing and talking with that day looked at me with eyes haunted by the terrors of that fire fight. For us, back in the base, the news about the debacle out in the field came through radio communications. If one stood radio watch, he heard the sad and frightening blow-by-blow account through the frantic calls of radio operators on site. We also got the news from the sounds of warfare out to our front. It was misty that day, as it was on many days at Khe Sanh, but that didn’t deter the report of explosions and small arms fire that flew at us from out of the field. We sat and waited and wondered if we would go out to relieve them. Several squads from our platoon, 2nd Platoon, mustered and saddled up and made way to the gate near the trash dump, and awaited orders to go out and help the Marines trapped in those ambushes. That scared me. I recall Corporal A, who arrived at Bravo Company about the same time I did, being in charge of those of us manning the lines, and it was a great comfort to me when I heard the scuff of his boots in the red mud. I wasn’t alone. 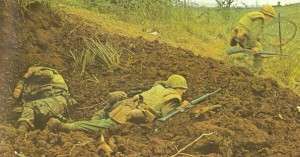 Later, the Marines of 2nd Platoon who had been ordered to stand by to go out in the field began filtering back into our positions with wild tales of incoming pinning them down as they tried to move out the gate. They also cussed the higher-ups who put out the incomprehensible word that any relief for those wounded and dying Marines out there would not come to pass. Orders came down—some opinions I’ve heard and read attribute the orders to Lyndon B. Johnson, president at the time—for us to remain inside the combat base. We abandoned those men. The stories that followed ate the inside of my guts, and that sensation remains with me today. It took almost two months for the remains of those brave and forsaken men to be retrieved. I recall, late on this date, fifty years ago, sitting in the trench with a Marine, Lance Corporal W, whom I knew from 3rd Platoon. A Native-American, he’d participated and lived through most of the combat action that Bravo Company had seen. He told me about what happened out there. About the death of 2nd Lieutenant Don Jacques, platoon commander of 3rd Platoon, about the ambush, and how he and others had carried the body of Lt. Jacques back. When he talked about bodies and wounds, the gunfire and death, I shivered. Forty years later, when I first heard the fire fight of February 25th termed Ghost Patrol, I thought of cheesy movies and found the glib nature of the name offensive. But over the years, I’ve gotten used to it. I think it very appropriate, because the ghosts of those men keep appearing in my memory. The ghosts show up in the families of the fallen, too. Last year I came in contact with a brother of one of the men who died on that patrol. He is haunted by the recollections of his brother back when they were young, and when his brother joined the Marines and went off for adventure and to do what generations of 20th Century America did: Joined up and fought. And what remains for him and for all of us, is the ghost, the ghosts. 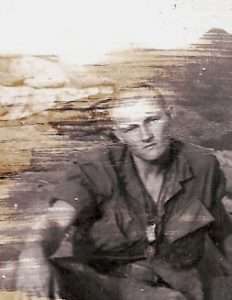 Ken Rodgers at Khe Sanh. Photo courtesy of the late Dan Horton. The men of the Ghost Patrol are now just names to most people but the images of them lying in bomb craters with red water in the bottom, waiting for us to save them inhabit my being. The ghosts often show up in my dreams. Together we man a trench in a night so dark it is almost impossible to see. I hear them breathing, the sound of dungarees swishing with motion, the clink and clack of weapons. And occasionally, I see some light, maybe the moon, the stars, or a flare, reflecting off the whites of their eyes.